If you’re after some feedback on your own surf photo’s, or just some inspiration, these are my top 5 sites for trainee surf photographers. I sense quite a lot of snobbery around peoples view of Flickr, it’s definitely got a lot of average photo’s on it, I pretty much use it as an on line back up for any vaguely interesting (to me) photo I’ve taken. Very frequently I find myself looking through my own (and my contacts) sets and collections to pick out a photo of a particular day or a break I’ve surfed, I don’t tend to use the more social aspect of the groups and forums but you can find some decent information on there and pretty much every photo you bring up has the EXIF data available so you can check out what settings people are using for their shots. Feedback is usually not that critical and mostly consists of people pasting gifs into your comments giving you awards or an invite into their groups, I think you need to build up a few trusted contacts and just take advice from them. You can also make private albums which only people who have the link can see, or you can make them visible to your contacts that are marked friends for instance, this is useful for sensitive spots or photo’s you don’t want all over the ‘net for some reason. 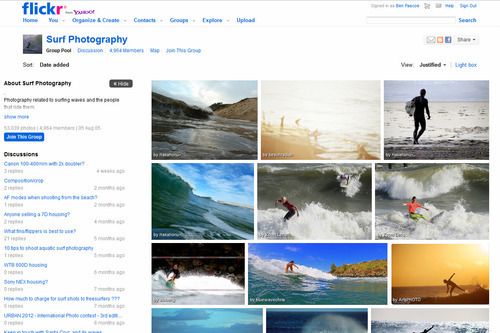 Uploaded by MSW users, you can sort by popularity and rating as well as filter by tags, it’s easy to find good shots, and it’s all surfing related so each shot should be of use to anyone learning surf photography. 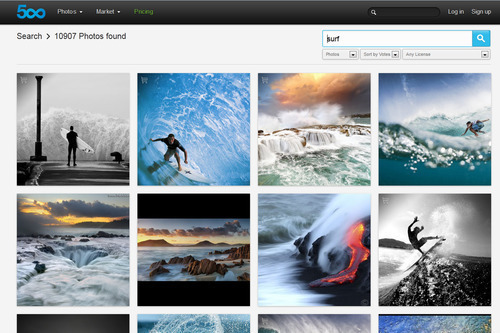 There’s some quality photographers uploading stuff frequently and there’s always fresh content, don’t expect any photography critique, it’s aimed at surfers rather than photographers so if you’ve got some pictures of a popular beach it’s always nice to stick them up on the relevant page and there’s a good chance the surfer will end up seeing them. You have your own profile when you sign up which you can use to direct people to your website and provide some contact info. 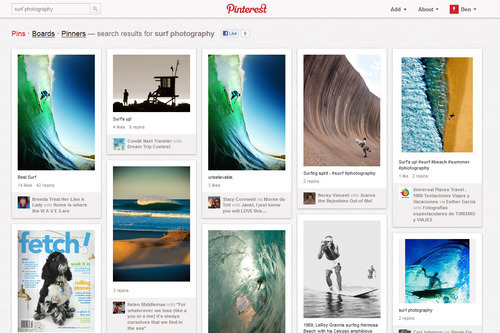 I’m new to Pinterest and haven’t really browsed that much, but it’s easy to dive in, especially on the mobile app, and you can search for and find photo’s and boards of themed pictures easily. I don’t think it’s that great a way to get feedback on your own photo’s but if you’ve got a nice image you could certainly get it seen quickly by lots of people by pinning it. 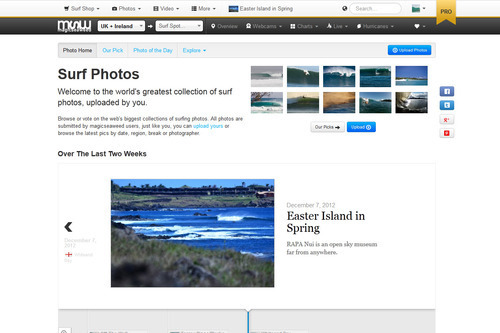 This is aimed squarely at photographers, and plenty of decent surf photographers have images on the site, give it a quick general browse first and you’ll see some spectacular images on there, it seems like the community is there for feedback but it’s definitely more intimidating than something like Flickr for the photo beginner. Like Flickr it displays the EXIF data for the shots so if you’re into finding out about the gear and settings used for some awesome photo’s this is a great place to spend a few minutes, the android app is pretty good for a quick browse too. 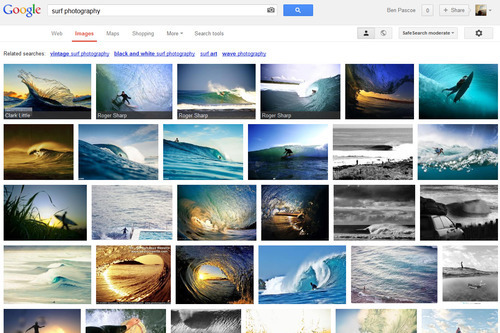 So everyone’s used it at some point, what it’s really useful for here is when you know what you’re looking for and just want to find out more, try searching for a particular surf photography technique via Google image search, you’re sure to find something relevant. I’m scraping the barrel a bit maybe on this one but don’t forget it’s there when you want a quick fix of inspiration. I haven’t forgotten Instagram, it’s not technically a website but I did dedicate a whole top 5 to Instagram in this previous post, well worth checking out if you haven’t already.